H’Hen Nie, the Vietnamese representative at Miss Universe 2018, recently announced she will wear a “Banh Mi” inspired outfit for the upcoming national costume themed segment of the Miss Universe 2018 pageant. 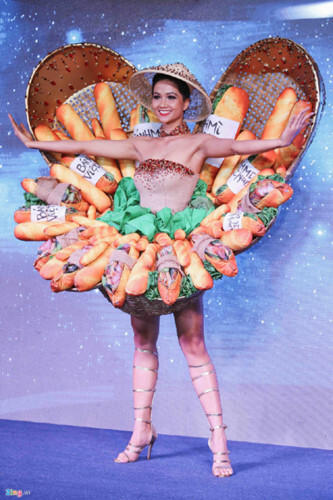 Miss Universe Vietnam H’Hen Nie chose to dress in an outfit with a “Banh Mi” (Bread) theme at a party held on November 21 ahead of competing at Miss Universe 2018 in Thailand. The outfit has been modified to be more suitable for competing at the Miss Universe pageant. In modelling the outfit, Nie shows both flair and creativeness. The television show “H’Hen Nie-Road To Miss Universe”, had seen a vote with the “Banh Mi” which is amongst six other designs to be worn at the Miss Universe pageant. During the event on November 21, H’Hen Nie dressed in 2 other outfits which were among the Top 3 of popular votes. “Pho Co” (Old Quarter) by designer Nguyen Dinh Thuan showcases cultural space in Hoi An’s ancient town with lanterns and Chua Cau (Pagoda Bridge). The major disadvantage of the dress is the dark colour which is seen as less suitable for the stage of the Miss Universe 2018 pageant.